We’ve been eating the Mike Dolce diet for awhile and one thing that has become more important to us is portion sizes. Dolce’s 21-day weight cutting diet has some specific guidelines for the amount of chicken and other items we’re supposed to eat every day. I figured it was time to get a proper food scale, and I was very surprised by how much I over-estimated the weight of the food I ate. 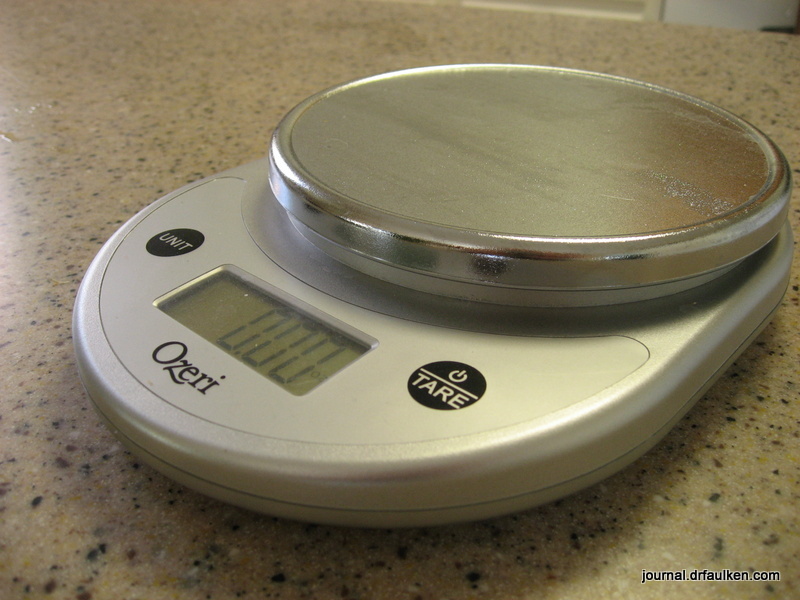 The Ozeri Pronto digital food scale is very bare-bones, but so is the price. At about $15 or less delivered via Amazon Prime, the scale is super easy to use. Put in two batteries (included), set the scale down, and push the power button. The scale has a tare function (in case you need to account for the weight of a container) and can give you measurements in English or Metric units. The Ozeri Pronto is accurate down to a gram, and has a maximum of 11 pounds. That’s more than enough for what we need for our diet. The scale will automatically turn off after about two minutes, or you can turn it off by pressing the power button again. The scale does not “lock,” so as soon as you add or remove items the scale’s reading will change. I don’t really need this functionality, but if it’s something you’re looking for the Pronto is not a good choice. I like the Ozeri Pronto. It’s a good deal if you’re looking for a super-inexpensive, no frills scale that is easy to use. Some people use their scale for postage as well, but I have a different, postage-specific scale for that. At $15 or less it’s a great starter scale for folks on a diet.